The Ohio State University’s Biological Science Department, Math Biological Institute, University Classroom Pool and Office of Information Technology Departments were housed in a building constructed in 1912 and in need of updating. 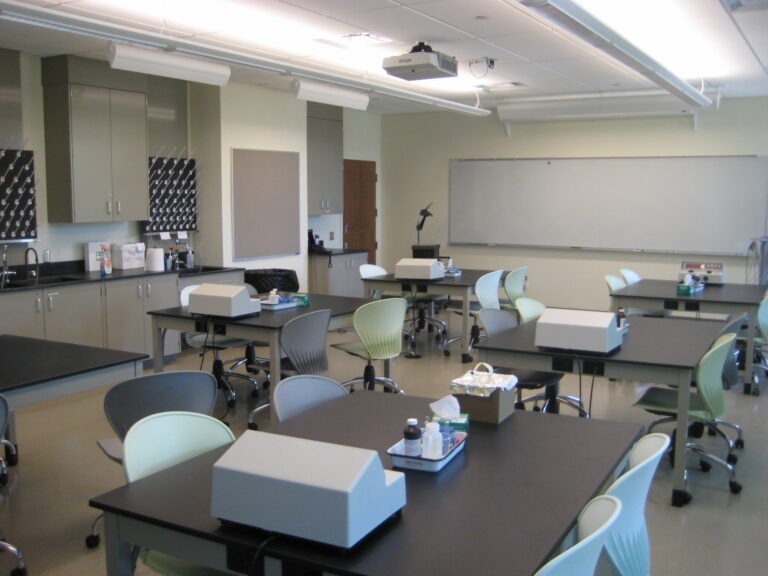 The project involved a 60,000-square-foot demolition and a 100,000-square-foot renovation, and included office space, IT closets on each floor, a central server room, 21 teaching laboratories with central lab prep rooms, six research laboratories, six pool classrooms, a computer room, a 250-seat auditorium, a 150-seat lecture hall, and a 100-seat tiered telepresence room. With this being an older facility with limited floor-to-floor height and concrete bearing walls, HAWA Inc.’s engineers designed vertical distribution of MEP systems. Included in the design was work associated with the medium voltage 13.2-kV site power distribution and building utility transformer. Sound levels were evaluated utilizing sound transmission software and sound attenuation was included into the design to allow screw chillers and air handling units to be located adjacent to classrooms without exceeding acceptable ambient noise levels.